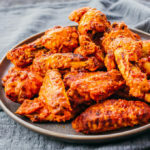 These Instant Pot Chicken Wings can be enjoyed with your favorite wing sauce, like a spicy buffalo hot sauce or a BBQ sauce. Prepare chicken wings by trimming off most of the fat but leaving the skin on; kitchen shears are helpful. If moist, pat dry with paper towels. Add to a gallon-size resealable bag. In a small bowl, combine all seasoning ingredients and stir together. Add the seasoning mix to the resealable bag with the wings. Toss until the wings are well-coated. Add 1 cup water to the pressure cooker pot. Place a trivet inside and the seasoned wings on top. Secure and seal the lid. Cook for 10 minutes at high pressure, followed by a manual pressure release. While waiting for the wings to cook, prepare a foil-lined baking sheet fitted with a baking rack. Spray with nonstick cooking spray and set aside. Position an oven rack about 8 inches from the broiler element. Set the broiler on high. When the wings are done pressure cooking, transfer them to a large bowl. Toss with hot sauce until well-coated. Place on the prepared baking rack, arranging in a single layer. Broil the wings until they start to blacken on top, about 5 minutes. Flip and broil until the other side starts to blacken, 3 to 5 minutes. Transfer the wings to a large bowl and toss with additional sauce if desired. Serve while hot.